There are twenty-four history museums and historical societies in the city of Charleston, South Carolina. Even within the confines of downtown, a visitor could peruse the stately home of a nineteenth-century shipping merchant or the much more modest home of an eighteenth-century furniture maker. There are museums dedicated to the history of Charleston, of South Carolina, and of dentistry. And in 2020, the city that once imported and sold more enslaved people than any other city in the United States will be the site of the International African American Museum. Across the country, museums explore the histories of all kinds of things—states, local communities, religious sects, music, steam engines, the Tuskegee Airmen. Commemorating this event, the National Museum of the Marine Corps was opened in Triangle, Virginia (near the Quantico Marine Base) on this same date in 2006. More on their unlikely friendship here and here. 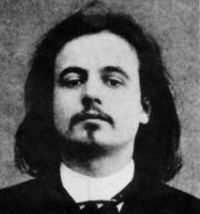 As we opt for the audio guide, we might recall that it was on this date in 1893, in the text of Alfred Jarry’s play Guignol in L’Écho de Paris littéraire illustré, that the term– and the concept of– ‘pataphysics first appeared. Jarry defined ‘pataphysics (derived from a contracted Greek formation that means “that which is above metaphysics”) as “the science of imaginary solutions, which symbolically attributes the properties of objects, described by their virtuality, to their lineaments.” Jarry insisted on the inclusion of the apostrophe in the orthography, ‘pataphysique and ‘pataphysics, “to avoid a simple pun”… indeed Jarry’s aim was to compound the puns: The term pataphysics is a paronym (considered a kind of pun in French) of metaphysics. Since the apostrophe in no way affects the meaning or pronunciation of pataphysics, this spelling of the term is a signal–a sly notation– to the reader, suggesting a variety of puns, among them patte à physique (“physics paw”), pas ta physique (“not your physics”), and pâte à physique (“physics pastry dough”). Jarry’s concept was resurrected after World War II with the foundation (in 1948) of The Collège de ‘Pataphysique, a “society committed to learned and inutilious research” (“inutilious” = “useless”). Its members have included Raymond Queneau, Eugène Ionesco, Joan Miró, Man Ray, Max Ernst, Julien Torma, Roger Shattuck, Groucho, Chico and Harpo Marx, and Marcel Duchamp. 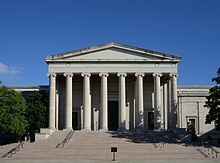 As we settle in, we might recall that it was on this date in 1941 that the National Gallery of Art was completed. It was officially “received” the following day by President Franklin Roosevelt from Paul Mellon, the son of Andrew Mellon, whose gift funded the construction and whose collection of Old masters constituted the core of the new museum’s collection. Now materially expanded, it remains open, free, to the public. 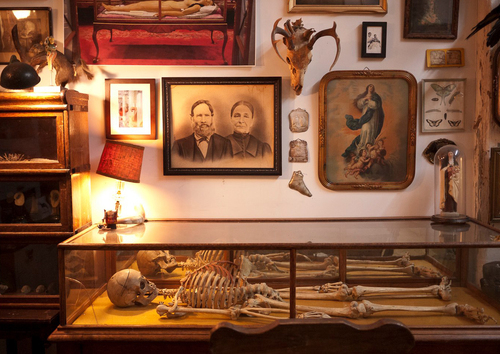 In order to see the appeal of the forthcoming Morbid Anatomy Museum, you have to understand the death-centric collection—think skeletons, taxidermy, medical oddities— as neither kitschy nor creepy. 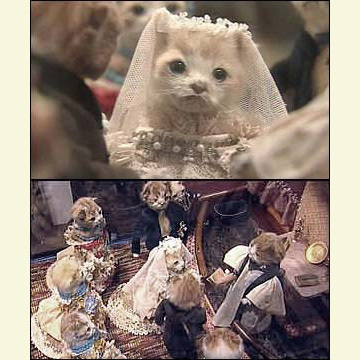 The Morbid Anatomy Museum opens in Brooklyn next month, when it will feature its permanent collection (sampled in the photo above), a 2500-volume library, a lecture series, classes (e.g., taxidermy), and special exhibits (like Water Potter’s “Kitten Wedding,” from the 1890s, pictured below). 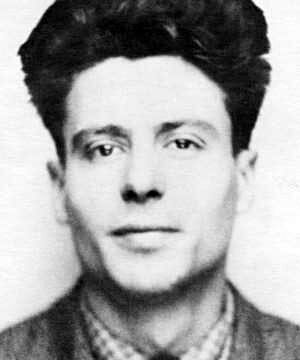 As we memento mori, we might we might send rebellious birthday greetings to Jean Vigo; he was born on this date in 1905. The son of Catalan anarchists, Vigo migrated to Paris and became a film maker. A founder (with Jean Renoir) of “poetic realism” in film, Vigo is best remembered for two films, both hugely impactful on French and world cinema: Zéro de conduite (1933) and L’Atalante (1934). 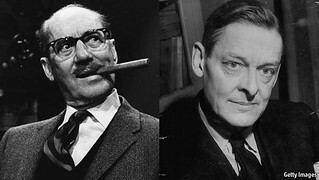 The former– a tale of rebellious school boys– was the inspiration for Lindsay Anderson’s marvelous If…; the latter– the story of a marriage falling apart, then healing– was chosen as the 10th-greatest film of all time in Sight & Sound’s 1962 poll, and as the 6th-best in its 1992 poll. He’s widely considered the “grandfather” of the French New Wave, on whom he had an enormous influence. 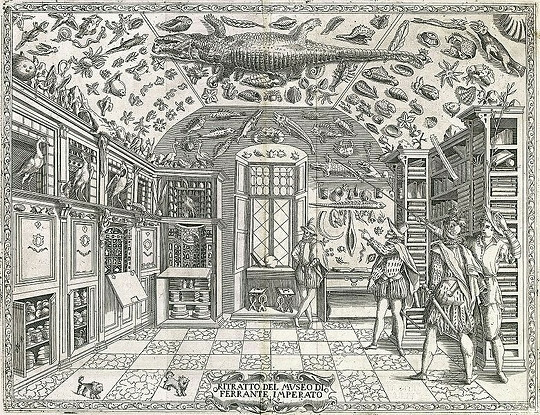 Engraving from the Dell’Historia Naturale (1599) showing Naples apothecary Ferrante Imperato’s cabinet of curiosities, the first pictorial representation of such a collection. In an age of data retrieval, when just about anything ever printed can be seen online and is eternally preserved there, and when modern anxiety is fueled by too much information, we would do well to remember that the loss of books and artefacts was catastrophic until very recently in human history. The great library of the Ptolemies at Alexandria was burnt by the Romans in the first century AD, a legendary collection of ancient wisdom whose loss haunted Renaissance scholarship. European savants of the 15th and 16th centuries were, in the midst of their astonishing revival of classical writing, all too aware of what was irrecoverable and even unknown to them. Sir Thomas Browne (1605-1682) was such a scholar. His vast expertise in areas as diverse as embryology, anatomy, ornithology, ancient history and literature, etymology, local archaeology, and pharmacy, and his participation in the Baconian programme to rescue learning from the misapprehensions and erasures that had accumulated since the fall of man, made him especially sensitive to such losses. Musaeum Clausum, a small tract both playful and melancholy, seems to coalesce early-modern feelings about the unavailability of precious intellectual treasure. Read the full fascinating story at always-illuminating Public Domain Review. As we engage encyclopedically, we might pause to send imaginative birthday greetings to Jules Ralph Feiffer; he was born on this date in 1929. A syndicated cartoonist, author, playwright, and screenwriter, he’s best known for his long-running Village Voice comic strip, Feiffer, for which he won the Pulitzer Prize. Feiffer broke into the trade at age 16 as an assistant to the immortal Will Eisner, who was at the time producing the strip The Spirit. A couple of years later, Eisner countered Feiffer’s request for a raise with the offer of a page in the comic book version of The Spirit, which Feiffer used to create Clifford, his first successful strip. His Village Voice strip ran for 42 years, and for most that period, was carried in other newspapers around the U.S. Feiffer’s plays include Little Murders (1967), Feiffer’s People (1969), Elliot Loves (1990), The White House Murder Case, and Grown Ups. And after Mike Nichols adapted Feiffer’s (unproduced) play Carnal Knowledge as a 1971 film, Feiffer scripted Robert Altman’s Popeye, Alain Resnais’s I Want to Go Home, and the film adaptation of Little Murders. 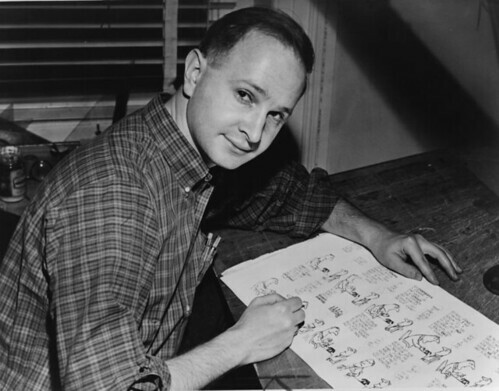 In addition to the Pulitzer, Feiffer was the recipient of a George Polk Award for his cartoons, an Academy Award for his animated short Munro, and the Obie and Outer Circle Critics Awards (for Little Murders and The White House Murder Case). 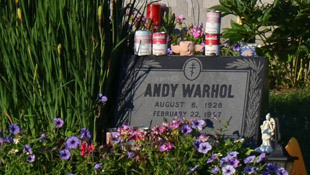 He was elected in 1995 to the American Academy of Arts and Letters; in 2004, he was inducted into the Comic Book Hall of Fame; that same year he received the National Cartoonists Society’s Milton Caniff Lifetime Achievement Award; and in 2006, he received the Creativity Foundation’s Laureate and a Lifetime Achievement Award from the Writers Guild of America. Here, you will find links from our archives to online collections and exhibits covering a vast array of interests and obsessions: Start with a review of classic art and architecture, and graduate to the study of mundane (and sometimes bizarre) objects elevated to art by their numbers, juxtaposition, or passion of the collector. The MoOM is organized into three sections. The Museum Campus contains links to brick-and-mortar museums with an interesting online presence. 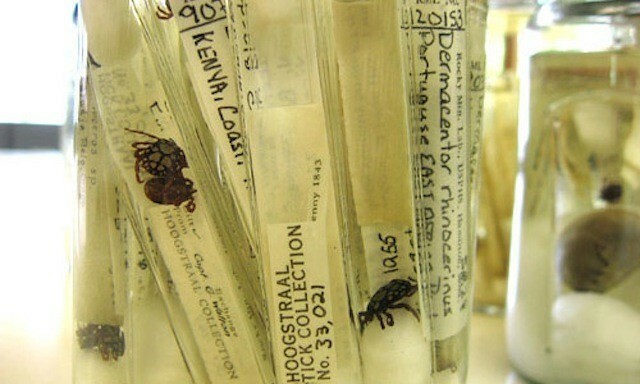 Most of these sites will have multiple exhibits from their collections (or, in the case of the Smithsonian, displays of items not on display in the Washington museum itself). The Permanent Collection displays links to exhibits of particular interest to design and advertising. Galleries, Exhibition, and Shows is an eclectic and ever-changing list of interesting links to collections and galleries, most of them hosted on personal web pages. In other words, it’s where all the good stuff is. Aside from the quarterly list of links, we pull out five collections of particular interest and highlight them. New to the MoOM this fall will be the The Benefactors’ Gallery, in which our Board of Directors will post links to their own and other notable collections. 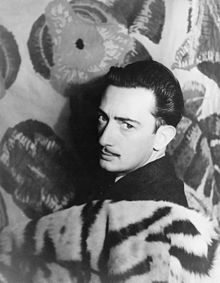 As we rethink the idea of “walls,” we might spare a fevered dream or two for Salvador Domingo Felipe Jacinto Dalí i Domènech, 1st Marqués de Dalí de Pubol; he died on this date in 1989. Best known by the name with which he signed his artwork, Salvador Dali, he was a prominent Surrealist, whose work was distinguished by his fine draughtsmanship and his obsession with symbolism. Cited as an artistic influence by the likes of Damien Hirst, Noel Fielding, and Jeff Koons, it seems likely that Dali’s gifted self-promotion was similarly an inspiration to Warhol.